This was breakfast this morning, and it was incredible. It’s the kind of breakfast that I have when I know I have 10 errands to run that morning, or if I am going on a field trip with the kindergarten class! It is delicious and keeps me going for hours. This time of year, all of the ingredients are sourced locally and I want to give a shout out to Prairie Boy Bread in Toronto who makes the best Double Fermented Multigrain Sourdough bread imaginable! In a pan, heat 1 tbsp coconut oil or bacon fat. Stir in the mushrooms and garlic, season with salt and pepper and sautee until softened. While the mushrooms are cooking, quickly wilt spinach in the same pan. Remove each to the plate when they are done. In the same pan, cook your egg to your liking. 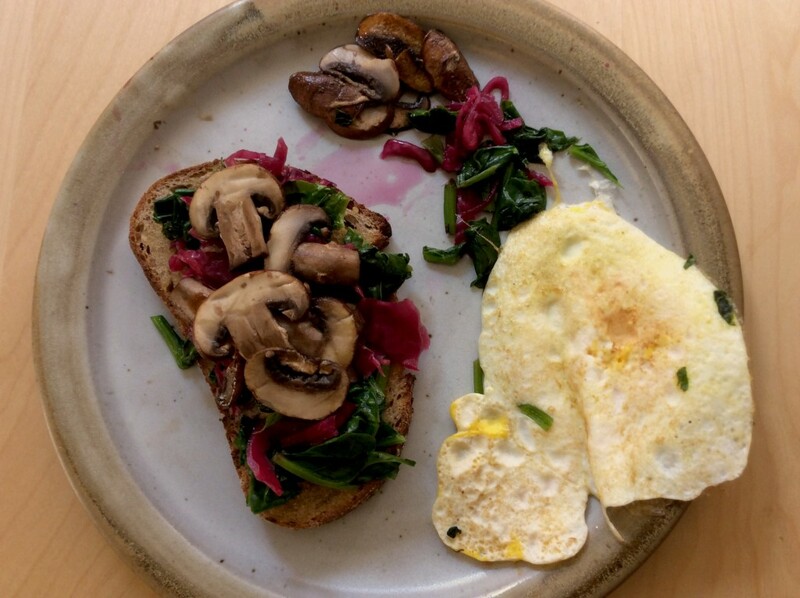 On the bread, layer the spinach, kraut, mushrooms and finally the egg.